Birthdays and babies happen through out the year, so how do you handle one of those events when so many holiday decorations and festivities have over taken your house? One way is to use the seasonal theme for your party. I am helping with a baby shower for my sister-in-law, and we decided to go with a “Lil’ Punkin” theme. At first my MIL wanted to do “The Great Pumpkin” in Oct. and make Suzy wear a big orange shirt. (Actually, it would be really cute, look here). But we decided on Nov. and cute, sweet smaller pumpkins. This is the invitation I designed digitally. 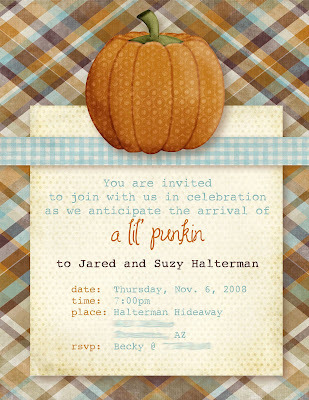 I was excited to use the Autumn Sky paper by Lisa Sisneros @ LDD, because it uses a little bit of blue–perfect since our “lil‘ punkin” will be a boy. The pumpkin graphic is by Summertime Designs (her downloads are all FREE–and she is collecting donations for a good cause here). When I printed these, I printed the pumpkins separately, cut them out and attached them with a 3-D adhesive square, to add a little fun. 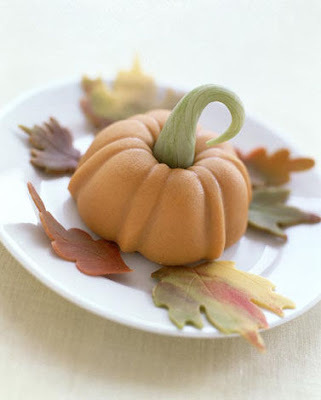 I’m going to make a pumpkin cake using two bundt pans, but if I had the right pans, and time, these would be adorable. 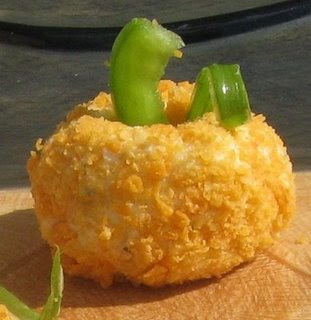 For other food, I love these mini cheese ball pumpkins from Gourmet Mom. Serve with crackers, pretzels, or veggies. So cute. Perfect for this theme. And you can save money by using a lot of the autumn decor you already have. These pumpkins would be perfect for this occasion. What a cute idea! I love the invite and the whole theme. Cre-a-tive! whoa! Love it, love it, love it! Such great ideas for a fall baby shower!!! I am hostessing two showers this weekend… wish I would have thought of this! What a great theme for a shower! Stop by, I have an award for you! So cute! What a great idea for a shower! There’s an award on my blog for you! Love those invitations! Can’t wait to see pictures from the shower! SO cute! I love this idea!!! This is so cute. I absolutely would have chosen it for my boys when they were boys. Colors, prints, the pumpkin! All so cute! Shut Up!! This is such a cute idea! !